Dainty Basket Brazilian Embroidery pattern stitched with EdMar rayon Brazilian Embroidery thread. This 3-dimensional design was designed by Dorothy Platt. Bonnie's HoopDeDo Brazilian Embroidery pattern stitched with EdMar rayon Brazilian Embroidery thread. This 3-dimensional design was designed by Dorothy Platt. 3" x 8" Level: Beginner Stencil this design in so many ways. Suitable for clothing or pillowcases. 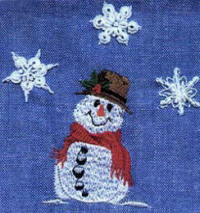 The border is made by working Pekinese Stitch through a running Lazy Daisy Stitch. Becky's Basket Brazilian Embroidery pattern. 6" x 4" Add a cute wheelbarrow filled with flowers to your next wearable. Add button flower pots filled with flowers to the design. Does not include flower pot buttons. 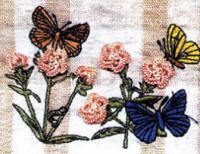 Butterflies on Cast-On Flowers- Brazilian Embroidery pattern stitched with EdMar rayon Brazilian Embroidery thread. This 3-dimensional design was designed by Dorothy Platt. Brazilian Embroidery Quick Stitch Towel - Part of design stitched by machine then marked for Brazilian Embroidery stitching enhancement. 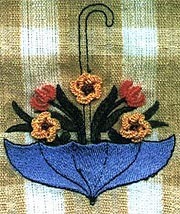 Dorothy's Denim Template - Brazilian Embroidery pattern stitched with EdMar rayon Brazilian Embroidery thread. This 3-dimensional design was designed by Dorothy Platt. Border Design for Wearables & Other Projects Design 3" x 12"
DP115 $8.00 Stencil How Many? Denim 2 Brazilian Embroidery Template Design for back of wearables. 3" x 12" This is Dorothy's second design for the back of denim shirts or jackets, even a vest. It features an arch of flowers suitable for a cute button or pin. 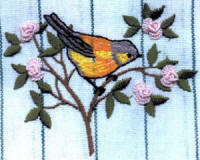 Rita's Ribbon Brazilian Embroidery pattern stitched with EdMar rayon Brazilian Embroidery thread. This 3-dimensional design was designed by Dorothy Platt. 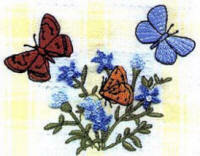 Butterfly Bush- Brazilian Embroidery pattern stitched with EdMar rayon Brazilian Embroidery thread. This 3-dimensional design was designed by Dorothy Platt. Cornucopia- Brazilian Embroidery pattern stitched with EdMar rayon Brazilian Embroidery thread. This 3-dimensional design was designed by Dorothy Platt. Quick Stitch Projects - Part of design stitched by machine and then marked for your Brazilian Embroidery stitching for enhancement . We Are One - Brazilian Embroidery pattern stitched with EdMar rayon Brazilian Embroidery thread. This 3-dimensional design was designed by Dorothy Platt. Stencil for placement is included as well as a outline for tracing. 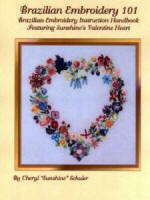 Recommended Reference: the Art of Dimensional Embroidery by Maria Freitas. DP233 $8.00 Stencil How Many?